IPOPI has started the launch of more patient testimonials, this time in German, done in close collaboration with dsai. 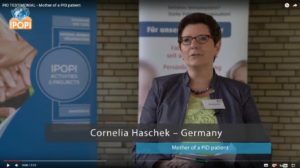 The German videos were officially released during the 2016 IPOPI biennial meeting and featured Kerstin Kugel and Cornelia Haschek, both mothers of teenage primary immunodeficiency (PID) patients. Cornelia goes over the period that led to her son’s diagnosis and what remains to be done in Germany for better care for PID patients. Kerstin became involved with dsai soon after her sons’ diagnosis and explains the importance of becoming involved with local patient groups to share information and learn from each other. In 2014 IPOPI produced a first series of patient testimonials in English. 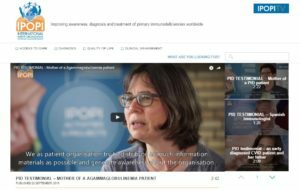 In this Video Road Show project IPOPI visited six different countries to produce videos in six different languages, with subtitles in English, broadening possibilities for awareness raising of PIDs, access to diagnosis, treatments, burden of treatment and PID quality of life. This project was supported by Baxalta/Shire; the rights and ownership of all films are owned by IPOPI and can be used by the co-producing NMOs for their national awareness raising purposes. More videos will soon be released on IPOPITV and on our social media pages.